If you're a fan of the Shrek movies, it doesn't matter if you're big or small; you can find Shrek Halloween costumes that will suit you. 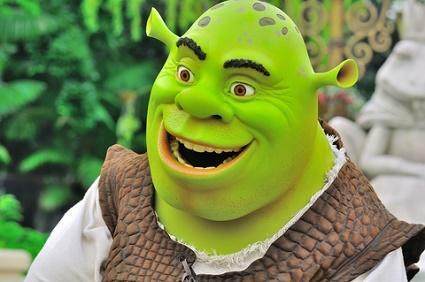 The Shrek movies have such a wide appeal, it's no wonder adults want to dress up as Shrek, Fiona, or even some of the more obscure characters in the films. Everyone has a favorite fairy tale, and Shrek meshes so many together, it's hard not to love the big green ogre and his friends-even if merely by association. As with plenty of adult Halloween costumes, prepare yourself for a few outrageous prices. Shrek's not the only thing that's green; so is that stuff that could be leaving your wallet in wads if you're really into the holiday and plan to have one of the best Shrek Halloween costumes on the street. There's the $37 Adult Shrek Men's Halloween Costume that includes the mask, the shirt/vest combo (bring your own belly for this one! ), pants, and sash. It's still a believable costume. It's just not as all-inclusive as its more expensive counterpart. Still, prince or pauper, you can be Shrek for Halloween. If you're a fan of patching your own costumes together every year for Halloween, you can purchase the mask only at Party City for just under $5. The Deluxe Fiona Halloween Costume is $50 and includes a dress and ogre ears. The Princess Fiona Deluxe from Fan Cosplay Costume Store is true to the emerald and olive color scheme. You can get this green crushed velvet dress and tiara with attached ears for $44.99. If you already have an old bridesmaid's dress or a costume from a Renaissance festival, you may only need a wig to be Fiona. Shrek: This Infant Costume is about $32 and includes the jumpsuit with an eared headpiece. Donkey: The Donkey Baby Costume is an adorable tribute to the movie. This romper comes in infant and newborn sizes and costs about $21. Puss 'n' Boots: This Puss 'n' Boots costume comes in sizes 4-6 or 8-10. You get the jumpsuit, an attached cape, boot tops and an open face character hood for about $30. Make your Halloween party or trick-or-treat session a night to remember. Create your own fairy tales while you're out and about in your Shrek Halloween costumes.